It is often heard that time is of the essence. In the cooking world, time is considered to be a major ingredient for creating a perfect dish. 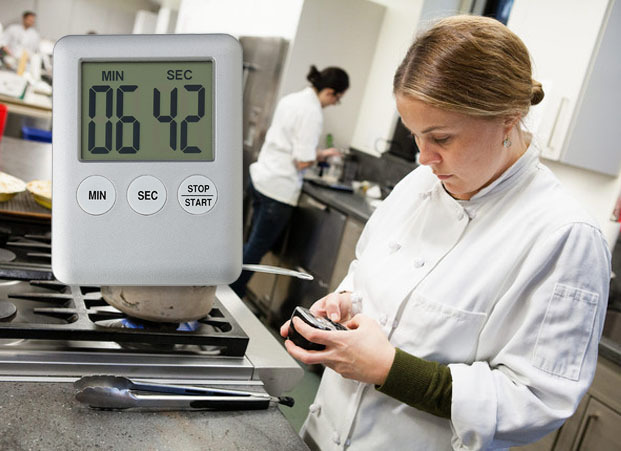 Kitchen timers are the key instruments in cooking, baking or creating a simple dish to perfection. 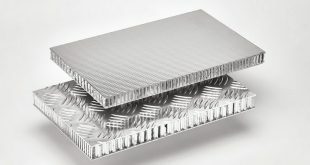 These serve to be the true strength of a professional culinary chef or an everyday household cook. How? Kitchen timers help ensure that the cake that you bake is soft and fluffy in texture rather than being hard and overcooked. They assist you so that the sauce you have been cooking for your pasta is not too dry or too runny in texture. These intricate factors are controlled by good timing which can be truly controlled in the kitchen by using kitchen timers. There are several things to consider and recognize when you are searching for kitchen timers. Do you want a mechanical kitchen timer or a digital kitchen timer? Should the timer be able to remain positioned with a magnet, with a retractable support or just be a free-standing one? Do you want your kitchen timer to serve a single purpose in the kitchen or do you want one that is adaptable to various activities outside the kitchen as well? This review should help you determine the right kitchen timer of your desire out of the large range of market offerings. 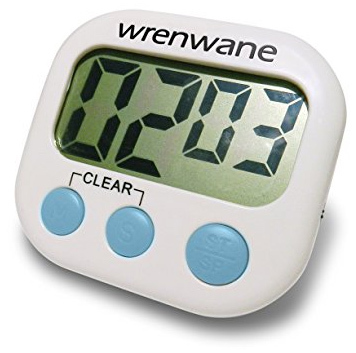 The Digital Kitchen Timer from Wrenwane is one of the most preferred kitchen timers within the market. 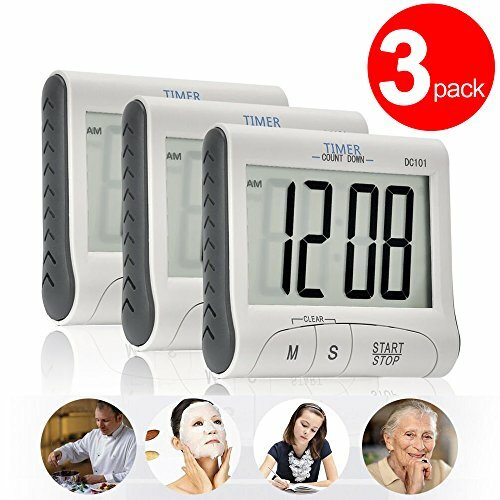 It is one of the most popular kitchen timers because users including my acquaintances and I have discovered that this product provides top of the class service. We were thrilled to find an enhancement of its features that make this product truly ideal. My acquaintances and I found the volume of the alarm to be perfect. It was not too loud nor inaudible. One of my colleagues who had 30% hearing loss due to a car accident, reported that she had no problem in hearing the alarm any time throughout her usage. We also found it incredibly hassle-free in reading the digits, particularly with the further increase of the digit size in the new model. Finally, this product was very supportive and convenient throughout the time we used it. 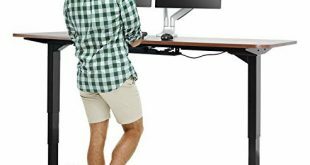 This is because of the magnetic support and retractable stand. My acquaintances with kids reported that the strong support protected the device well from the mishandling of children. One of the main issues that were recurrent with this product while in use was that it could not be seen well within the dark. The light that was meant to keep the digits visible in the dark, could not prove to be of the right intensity. Also, the design and color of the design were not liked by most of my colleagues who used the product. They suggested that a greater contrast of color is required for enhanced visibility, especially in dim light or within a dark environment. 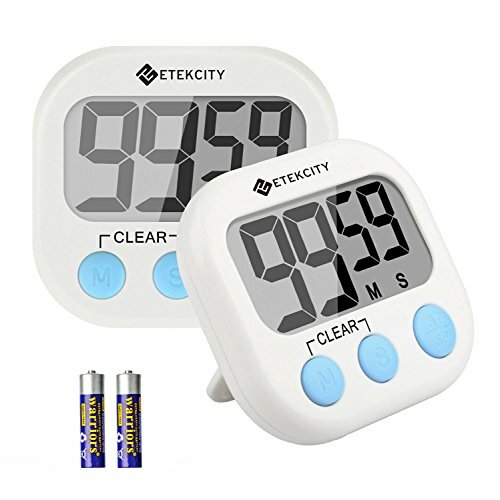 The Digital Kitchen and Cooking Timer from Etekcity is one of the most desired kitchen timers within the current market. My family and I felt like this product deserves to be categorized as one of the best kitchen timers available. This is because most of the users including us appreciated this kitchen timer’s convenient and beneficial features. Similarly as most of the users found within the market, my family and I felt pleased about the clear visual display, loud alarm system and great portability of this product. My 75-year old grandfather who has arthritis and is not really tech savvy, felt really comforted by this product. He found it easy to hear the ringing sound of the alarm from 2 rooms away. My mother also found the timer to be very helpful in keeping her in schedule with her daily duties. She found it convenient to carry it around and mentioned how easily the screen can be viewed from across the room. Some of my family members felt annoyed at the constant beeping sound when you enter the numbers. Therefore, they ended up putting a thin layer of sticky tape over one of the sound releasing areas. Some of my family members felt quite disturbed by the loud alarm system and wished that there was a volume control system so that they could set a more desirable volume of sound. My neighbor who tried out this same product, reported that he felt restricted with a limitation of up to 99 minutes. 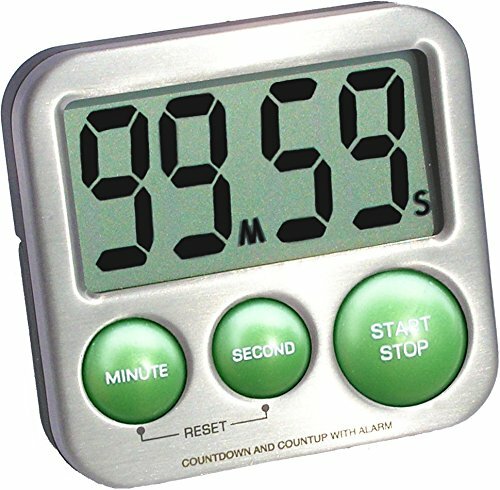 The Digital Kitchen Timer by XREXS is one of the most preferred kitchen timers available in the market. The features of this kitchen timer that make the lives of its users including my coworkers and mine easier include the product’s easy-to-view visual display, keyboard-like controls and a truly functional alarm system. My colleagues and I were delighted to have a timer that was able to successfully wake us up with a functional alarm. The highlight is that the alarm sound keeps on increasing until you wake up and turn it off. The keyboard-like controls will help you to set alarms up with specific inputs for minutes and seconds. The visual display is an LCD clock which can be viewed distinctly from across a room. Some of my colleagues were unsatisfied with this product because of the strong blaring sound of the alarm. One of them were also disappointed to have the magnetic support feature being built into the rear stabilizing stand. My colleague wanted to set up the timer at an eye level if it could have been attached to the refrigerator with the magnet placed at the back of the product, according to her preference. She believed that this would have helped her to check the timer without having to move it with her busy and unclean hands when cooking. Most of my colleagues found it challenging to understand how to use the timer from a complicatedly written instruction guide. They believed that there were so many features left for them to explore. One of my colleagues found the LCD screen to have showed very faint digits at the beginning. After inserting the brand new batteries instead of the ones that were given with the package, he had been able to truly enjoy the timer’s performance. The Digital Kitchen Timer from Senbowe are one of the best kitchen timers within the market because of the comfort and convenience it provides to all its users including my friends and me who had tried out this product for a couple of weeks. We were thrilled with the easy visibility of the clock screen and its high portability. My friends and I found this kitchen timer to be extremely resourceful both inside and outside the kitchen, especially when timing our deep fryer. We were able to monitor the large display of bold digits correctly from significant distances. In fact, one of my friends with poor eyesight was also able to read from the screen easily while being away from a significantly large distance on a day when her glasses had been broken. What is more delightful is that the level of sound from the alarm is perfect, that is, it is not too deafening for the sensitive individuals. With 2 systems of support from a magnet and a retractable stand, you can set the timer up in the kitchen or in the park while stretching. Few of my friends complained that the product is not very easy to reset. You will be required to pull out the batteries after removing the cover which requires extra unnecessary effort. Another friend of mine found it difficult to set up timings that fell in between the hourly intervals (in minutes). The batteries also appeared to be drained out quickly by the device according to many of my friends. The magnet included as a support system also did not appear to have been functioning ideally after a week or two. We all agreed that the buttons required high amount of force in order to work. The Digital Kitchen Timer from Great Polly is one of the top rated kitchen timers present within the current market. This is because most of the users within the market along with my colleagues and me who tried out this product, found this product to be very helpful in alerting its users at important times. My colleagues and I were well alerted by the product’s intense alarm sound. The volume was mostly considered to be distinct and of an adequate range, loud enough to be heard from another room. Even my elderly colleagues who have slight difficulties in hearing, found the sound of the alarm audible from another room. The screen display of the product could also be clearly seen from extensive distances with a wide LCD display and bright, large-sized digits. My grandma who has poor eyesight had no trouble in reading the display from a sizable distance. We noticed that the device maintained its set timings cleverly from a long time ago. Timing can be counted up and down as you will find no trouble in setting up your exactly desired minutes and seconds as inputs. My colleagues who love travelling loved taking this timer along with them because of the easy retractable support included. The magnet support will help you as well to keep it attached to your refrigerator in the kitchen. The On and Off functions allow power to be saved and lengthen the batteries’ longevity. Most of my colleagues did not experience many drawbacks from the product. One of my colleagues found the alarm sound unbearable while the other unfortunately received the product that malfunctioned after a few days. The Digital Kitchen Timer from Kumeida is one of the top sought kitchen timers available within the market by its vast number of users. My office team and I decided to try out this product for a couple of weeks and we were all impressed, in overall. 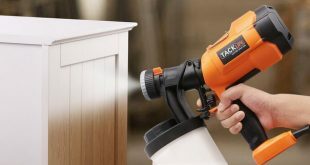 One of the biggest reasons for the popularity of this product, in my opinion, is in providing its users the ability to adjust the volume of the alarm sound. This feature is highly searched for within the market by its users but this is one of the few kitchen timers with such a feature. We also liked the easy readability of the digits on the screen. The compact structure of this device also proved to be an advantage for us as it was easy to store and carry around. We found the device easy to control as we could start and stop the timing with a simple push and re-push of a button. 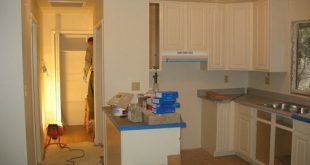 The magnetic support included made the device easy to place within the kitchen. The only drawback of this product was that it did not last as long other competing brands. Actually, a couple of these malfunctioned after a few weeks. One of my colleagues also found the constant beeping sound when inserting numbers as annoying. The Magnetic Digital Kitchen Timer by Mudder is one of the most popular kitchen timers within the market. This is because most users including my relatives and I love this product for its high versatility and fulfilling attributes. My relatives and I found this product to be highly versatile. This product can be set according to different modes. 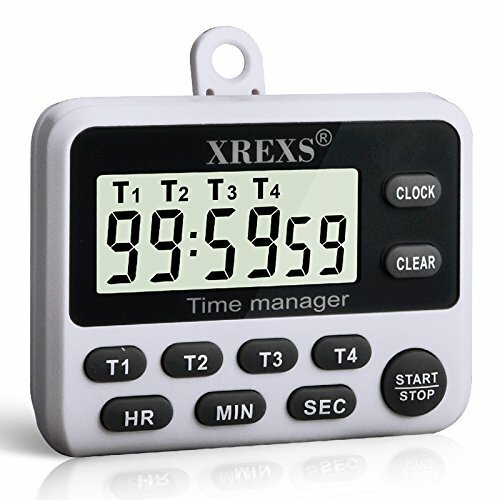 Moreover, you can use it as a timer as well as a clock to keep yourself programmed accurately. 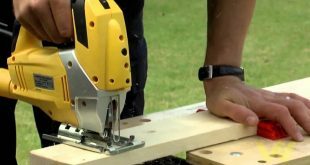 It is flexible to position this device within the kitchen or outside the house because of the included supporting magnet, hook and bracket back. We evaluated the device to be user-friendly because of the ease in setting a desired time and retaining the memory of past settings. We found the sound of the alarm appropriate to be heard over long distances without having too much of an irritating blare to it. Some of my relatives were disheartened to find that the magnet was too fragile. Another disappointing feature a few of my relatives disliked was that the alarm beeps for only one minute before turning itself off automatically. Furthermore, setting up the desired time requires an individual to push one button several times. 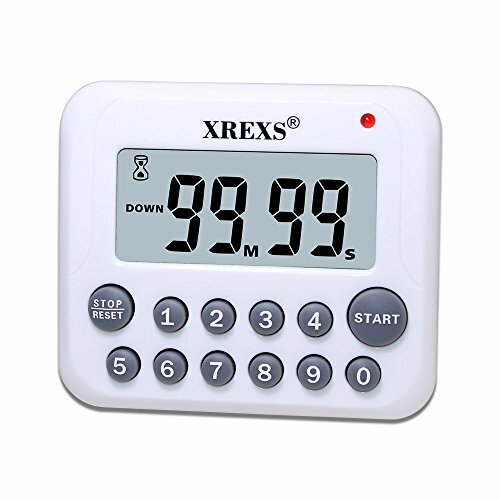 XREXS 4 Channels Digital Kitchen Timer Clock which is offered by US Rexs LLC is one of the best kitchen timers within the market. Both adult users and children as well as my family and me loved having this in our kitchen. We all mainly liked this product because of its appealing design that resembles an adorable rooster. We also discovered that this product brightens our whole kitchen as a beautiful decoration. Children in our household loved using this timer to fulfill their daily duties. We were very delighted to know that it is performs mechanically so, it does not require any batteries. Unfortunately, we all ended up realizing that the product is made of poor quality plastic. This means that the longevity of this product is comparatively quite low. This is because it ended up malfunctioning or breaking after a few weeks in some of the cases. After a day or two of handling of this product by children led to an immediate damage of the product. eT-25 Digital Kitchen Timer from eTradewinds is one of the most stylish looking, resourceful kitchen timers within the current market. Apart from the timer’s captivating appearance, my coworkers and I along with the users of the market, found this product to have performed with extensive strength and high durability. This timer has been widely considered to have been the strongest time magnets. My coworkers and I tried this product out and discovered that it has a high product lifespan because of its steel hard body. It is highly appreciable that the company issues a lifetime warranty and complimentary product replacement. Even though it has a strong structure, my coworkers have complained about its quick drainage of battery charge. Also, the alarm sound is not too loud and can only be heard within the same room. Although the visual display is vivid and readable in the light, it is impossible to read the display in the dark or in dim light. 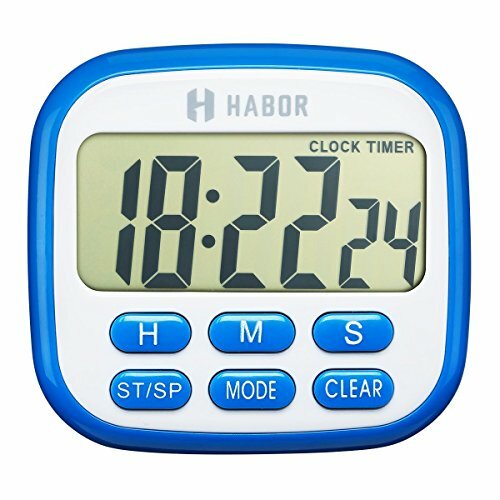 The Digital Kitchen Timer from Habor is one of the best kitchen timers available. This is because most users including my family and I appreciate the accessibility to wider range of settings that include the hours, minutes and seconds to be set. My family and I love how this timer is designed to be multipurpose. The 3-in-1 design of this product will allow you to specify your desired timing with hours, minutes and seconds. 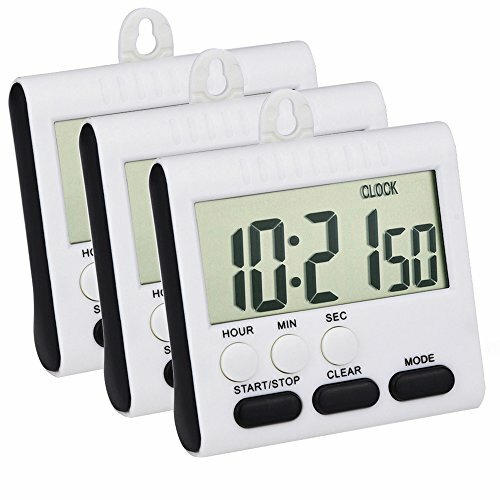 This product has the ability to count up time, count down time and serve as a clock all at the same time. This helps in fulfilling various activities including those outside the kitchen. We found that the alarm’s beeping sound is just right being not too loud neither inaudible. Your timer will additionally be supported by a magnet, hook for hanging and retractable stand. Unfortunately, we have learned that the product does not last more than six months in most cases. This is because the structure is made of fragile plastic. 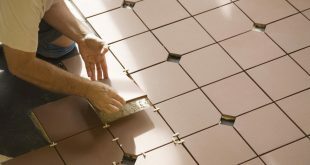 The adhesive part of the magnet usually does not last too long so cannot provide complete support for a long time. 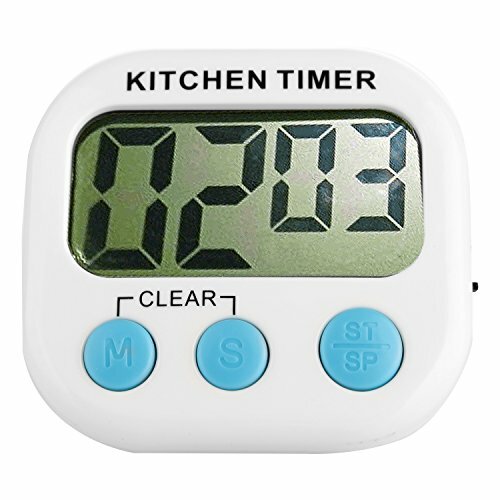 The Mechanical Kitchen Timer is one of the best mechanical kitchen timers one could purchase from the present market. My family and I, as well as most of the users within the market adore the unique visual aspect of this product and consider it to be very simple to handle. My family and I have found this product to be exceedingly functional as a time counter. 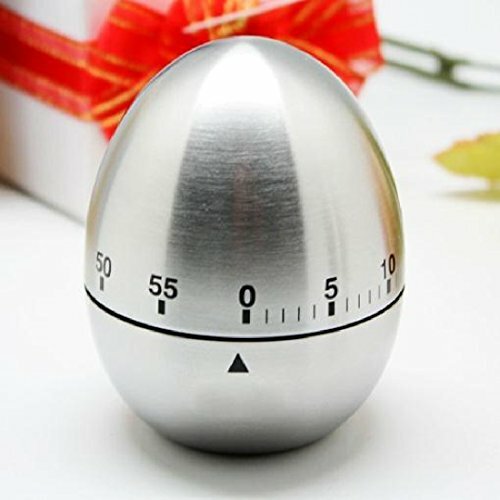 The unique egg-like shape of the timer enhanced the visual aesthetics of the kitchen. It was also delightful for us to have such an interesting item in the kitchen. We found the timer very easy to use as all we needed to do for it to work was to effortlessly rotate the object to our intended time. The vivid display of the scale also made the product very easy to read and use correctly. As I found this product to be functioning quite well with its interesting appearance, I decided to purchase more of them to gift to my aunties and cousins. Except for one of my cousins, the others liked this product a lot. Unfortunately, my cousin was disappointed by this product because it had stopped working after two days. She also felt irritated by the sound of the time being counted down initially when it was working. Ultimately after 2 days, even the sound stopped being produced. 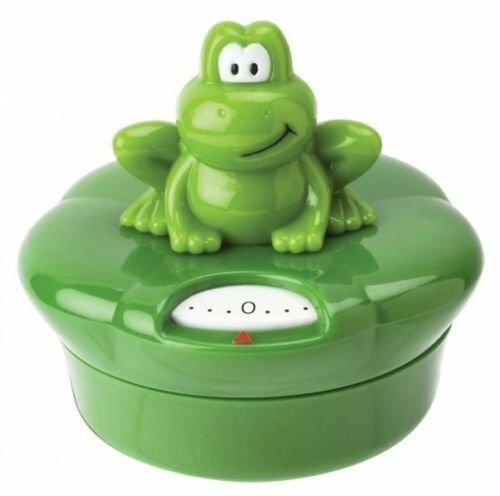 The Joie Ribbit Frog Mechanical Kitchen Timer offered by MSC International is one the best mechanical kitchen timers within the current market. My family members and I, as well as many of its users within the market, are highly impressed by this product’s appealing visual aspect and the simplicity in its usage requirement. My family and I believe that this product serves well as an interior decoration item and as a perfect item to be gifted in addition to being just a kitchen timer. Most of the young users including those within my family enjoyed using this product as it looked adorable and was resourceful. 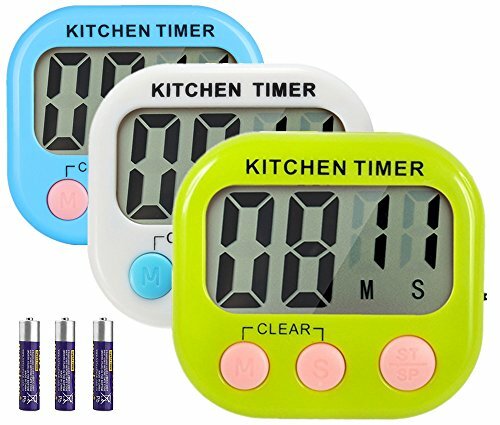 Apart from using these timers in the kitchen, we found it to be useful during other household activities like playing games. It even proved to be of great assistance when my niece was being potty-trained! In order to easily use this timer, all you would need to do is twist the frog while keeping a hold of the main base of the product in order to set the time. The timer can be easily set up to the 60-minute limit. My family and I found it extremely convenient in keeping this timer spotless. We were just advised by the packaging to wipe the product with a damp piece of cloth. I recommended my coworkers to try this product out. After beginning to use the product, a majority of them appeared impressed and were pleased. However, a few of them reported that the product was fragile and did not last longer than a week.